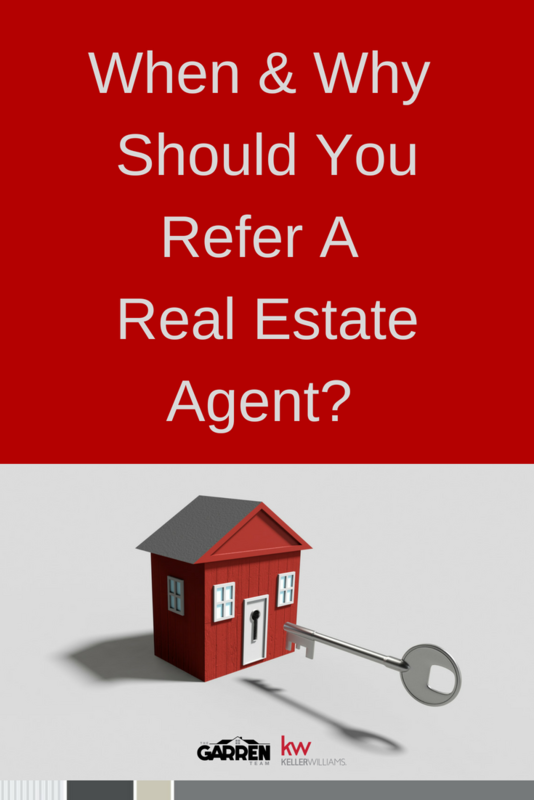 When & Why Should You Refer A Real Estate Agent? You probably know a real estate agent or two. Are you constantly thinking about them? Are you constantly on the lookout for people you can refer to them, who are buying, selling, or renting real estate? Are you keeping your ears peeled to hear even the slightest hint of someone making a move? You’re probably not. But the real estate agents you know wish you were. Some people are natural “connectors”, and are always ready to recommend this person or that person to someone looking for some sort of help. But many people are not. It’s not like most people are walking around thinking about a real estate agent’s business and needs 24/7. Most people are busy enough with their own days and lives. It isn’t like you wouldn’t recommend an agent…if the moment came up. It just isn’t the first thing on your mind. After all, what’s in it for you? (W.I.I.F.Y as it is often referred to…) It’s totally human and OK to feel that way. And, given real agents can’t legally compensate you what is in it for you? There’s a lot of real estate agents in the field. But not all of them are created equal. Some are better than others. So, when you know a good real estate agent, make sure to refer your friends, family, and anyone you meet, to that agent. You’ll save the people you know a lot of time, money, and aggravation. It’s hard to understand this until you’ve done it (so just try it and see for yourself), but people really do appreciate a person who hooks them up with a great real estate agent. Referring a great agent to someone simply makes you look good. It makes you look smart, and in the know. It makes you seem “connected” and hooked up with someone that your friends and family will feel fortunate to have been hooked up with. Who doesn’t like to look good in the eyes of their friends, family, and peers? Real estate is a tough business to succeed in. There’s only so much business to go around, and there’s always a whole lot of agents trying to get enough business to survive, let alone thrive. Sure, it’s on the agent to prospect, market, and dig up enough business on their own. But, a huge part of doing that needs to come from people referring them. So, they are probably reaching out to you and reminding you that they are in the business and there for you (and anyone you know) when you buy, sell, or rent real estate. They aren’t trying to be a pest. They are trying to survive. And ideally, thrive. Help the agent you know. They want and need it. Too many subpar agents exist and flood the field. When you know a good, trustworthy, honest, and dependable person who is a real estate agent, refer him or her. It’s for the good of the industry. And, a better real estate industry benefits you, the consumer, in the long run. Real estate agents and the industry as a whole suffer from a less than stellar perception in the public’s eye. You can help improve and change that by referring the great agent you know, and make it harder for those who are not doing the best job for people to exist. This one isn’t something you might think to do… But, if you know a real estate agent you trust, and hear about someone moving outside of the area they specialize in, you should still refer your friend, family member, or acquaintance to that agent. The agent will then refer the person you know to the best agent in the area they are moving to. Look at this as “birds of a feather”. If you know and trust an agent locally, they’re going to have the resources and be able to refer an agent out of area who does business in a similar manner as they do. If you know someone trying to “for sale by owner”, and it just isn’t going well, let them know about the agent you trust. The owner is likely being bombarded by agents calling and knocking, and would probably appreciate having someone just give them the name of a trustworthy agent. Real estate agents give their time, thought, and advice freely. Literally…it’s free. Until and unless a person buys or sells a house through them. And it’s something most great agents do without hesitation. Without pressure or obligation. A great real estate agent wants to help anyone you know if they have any real estate related questions or concerns — even if they aren’t buying, selling, or renting in the immediate future. This is a good time for an agent to meet someone and build a long-term relationship, and help someone who needs it. So, keep your eyes open, and your ears peeled…and refer away. It’ll be appreciated by the agent you know and trust!